Wouldn't it be great to ditch our cars and have more bikes than people (like the Netherlands)? Imagine cities with dedicated bike paths and educated drivers who respect the rights of riders. It would be heavenly. After over a month in Europe and biking in Berlin, the Netherlands and Belgium I can't get enough of life on two wheels. It's true–I'm completely obsessed. In Maastricht I was blown away to see seniors well into their 70s and 80s breezing past me on bikes. And everyone looks so healthy and happy. Clearly they are on to something. The biking culture is building the U.S. in cities like Davis, CA but not quickly enough. Biking infrastructure would solve so many issues with energy consumption, pollution, traffic and most important health and well-being. It seems like such a no brainer. 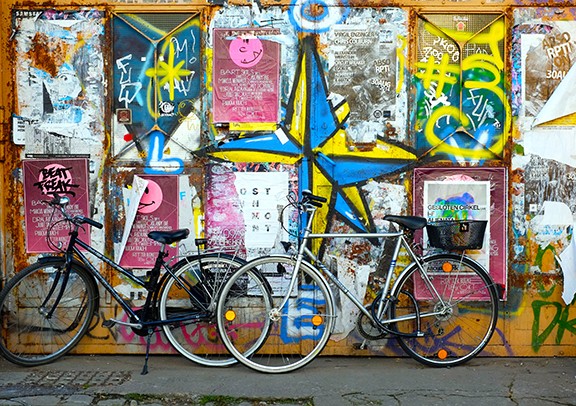 I would love to know more about urban areas with bike cultures so please comment and share your info.